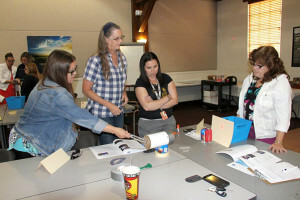 Teachers use simple objects to produce sound waves that can be seen when using a laser light beam during a NASA education workshop at the AERO Institute in Palmdale, Calif. NASA and Lockheed are using Schlieren photography to see how they can lessen the noise produced by supersonic aircraft. The workshop, conducted by education specialist Barbie Buckner, was held at the NASA Armstrong Flight Research Center’s Office of Education’s Resource Center located at the AERO Institute in Palmdale, Calif.
Sonic booms may be sweet music to many around the Antelope Valley. However, not everyone across the country appreciates their windows and pets getting rattled by shock waves. Someone living in a supersonic corridor may experience 15-30 booms a day. NASA aerodynamics engineer Larry J. Cliatt II lectured educators during a NASA Armstrong Education Workshop, “Seeing Sound,” at the AERO Institute in Palmdale, Calif. 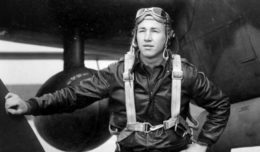 He presented ways engineers are developing supersonic airplanes that can break the speed of sound, while diminishing the sonic boom. Using Schlieren photography, previously invisible shock waves produced by aircraft can now be seen. Engineers are using those images to design aircraft for smoother and quieter aerodynamics and changing wing shapes that will disperse the sound energy before it hits the earth — preventing or lessening sonic booms. NASA and Lockheed Martin have teamed up to build a quiet Supersonic Technology (QueSST) X-Plane that will make flight greener and quieter. 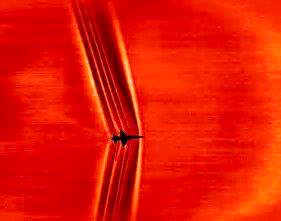 Schlieren images provide a unique glimpse of the shape of shock waves created by supersonic jet aircraft. Engineers can use this information to design sleeker, quieter supersonic aircraft. Sonic software used on current generation supersonic aircraft helps pilots to place booms in specific locations, away from populated areas. Chemical compounds change at fast speeds, so the aircraft must also be very heat resilient. At the workshop, teachers used simple objects such as a balloon, PVC and a laser — light to see how sound waves can be seen. Bringing experiments back to the classroom exposes students to aerodynamics, sound engineering and math in a fun and logical way.